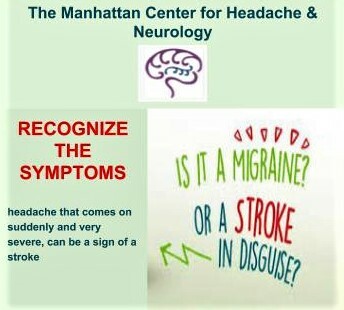 Some migraine symptoms are very similar to those of a stroke. For new onset migraines over 40 years old, always assume that it is something serious. It is uncommon to have a first migraine when you are older. People with migraines usually have it for most of their life. A TIA, Transient Ischemic Attack, is a type of stroke that is often mistaken for a migraine. This is also called a mini-stroke because blood flow to the brain is cut off for a short period of time. Symptoms of a TIA usually resolves within an hour. Migraine with aura is often confused with a stroke. An aura usually occurs before the headache phase. An aura may include visual or sensory symptoms, such as flashing lights, zig-zag lines, blind spots, or numbness or tingling in your arms, legs or face. Some patients may experience ringing in the ears and difficulty speaking. Sometimes these aura symptoms occur without even a headache. It can be hard to tell the difference between a TIA and a Migraine with Aura. Stroke symptoms usually occur more suddenly whereas migraines are more gradual. If you think there is a slight chance that you are having a stroke, call 911 immediately. Early treatment can decrease damage to your brain and even save your life.